Centrally located in Arosa, within a 5-minute drive from both Hörnli and Weisshorn Cable Cars, Haus Erika B features a self-catered and fully furnished apartment with cable TV and DVD player, Wi-Fi on request only and a garage parking, all provided free of charge. It consists of 1 bedroom, a living room and an open-plan kitchen, as well as 1 bathroom with bathtub/shower..
Haus Erika A price per day from CHF 120 Centrally located in Arosa, within a 5-minute drive from both Hörnli and Weisshorn Cable Cars, Haus Erika A features a self-catered and fully furnished apartment with cable TV and DVD player, Wi-Fi and a garage parking, all provided free of charge. The accommodation unit comprises a south-facing furnished balcony with a mountain view. Casa Irmella Located in a sunny and quiet area of Arosa, Casa Irmella offers views of the Schiesshorn and Schafrücken Mountains. Chur is 30 km from the property, and free public parking is possible on site..
Blatter\ Set in the quiet ski resort of Arosa, Blatter's Bellavista Hotel enjoys a perfect location within the Swiss Alps. Guests of the Bellavista can relax in the beautiful spa area featuring an indoor pool, a sauna and massages. A rich buffet breakfast and a 5-course dinner menu are available here..
Hotel Streiff Superior price per day from € 69 Situated in Arosa, Hotel Streiff Superior is close to cable cars and the area’s Obersee Lake and Untersee Lake. Guests can relax at the hotel's own spa area Edelweiss. In good snow conditions, guests can ski directly from the hotel..
Robinson Club Arosa Full board is included in all rates and the hotel offers free parking and an indoor pool. 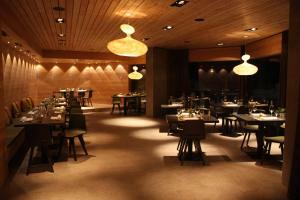 The rooms of the Robinson Club Arosa offers panoramic views of the surrounding mountains..